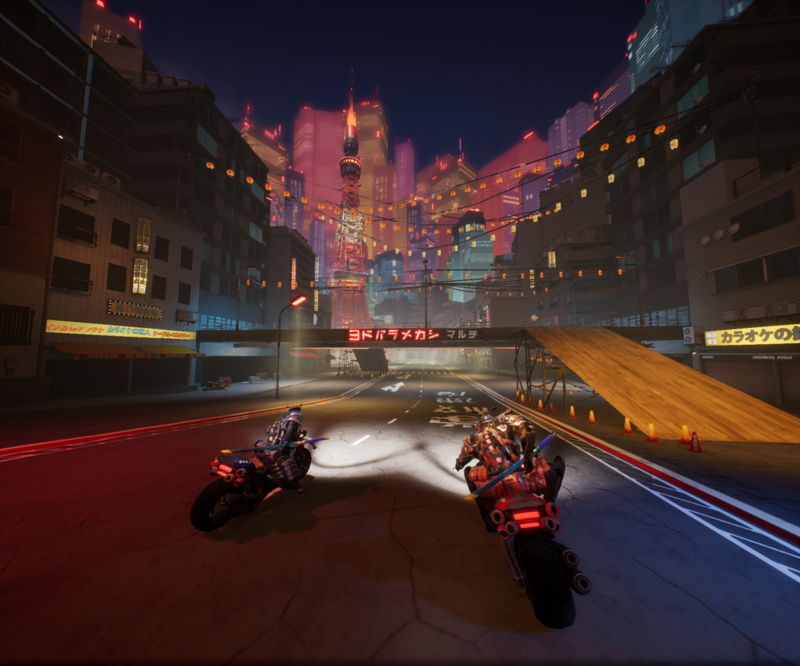 The sun sets down on the avenues of Yumeshima, as you and your friend jump on your motorbikes and start the engine. You spot a small group of punks screwing around in an alley. It is time to show them who is the real owner of theses streets. In Aichi Emperors Zero you embody two members of and old biker gang, battling to death to repeal the young hooligans who invaded your city. 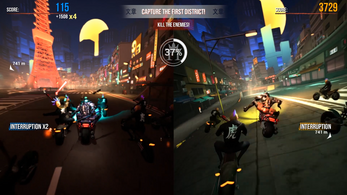 Riding your bike through the city of Yumeshima, you will have to help each other to defeat the punks. On your journey, you will face deadly challenges. But in the end, the city will be yours! Your goal is to claim back your territory by capturing each of the three districts handled by the punks: Atsuta, the northern area and its temple, Kobaya, the modern neighbourhood, dominated by the shiba tower, and finally Shinisho the business district, and his overwhelming skyline. Gradually taking back Yumeshima will prove your worth as samurai to the disrespectful punks. However, you will have to face one last challenge before claiming the city as yours. As you take a hold of the third district, the leader of the punks will appear. Bigger and stronger than the average enemy, the boss can create a mystical energy shield, that you have to break as a team, using a deadly combo attack : The Emperor’s Blast ! 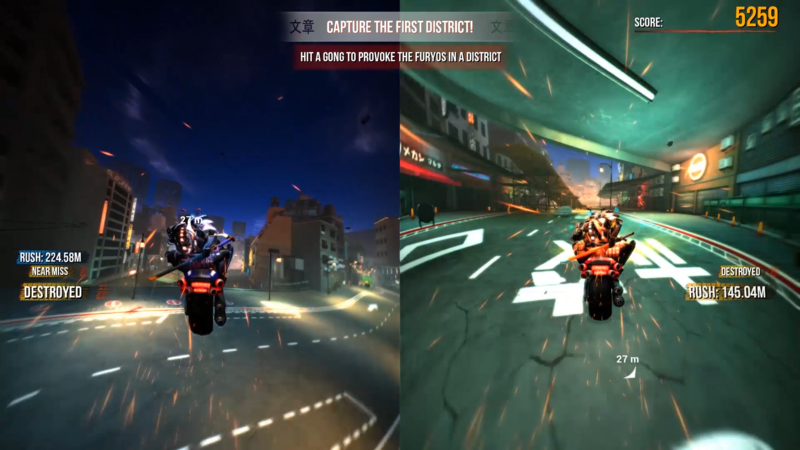 By braking and turning at the same time, you will be able to drift. The more you skid, the stronger the boost at the end of the drift. Learn to time your actions, as the game really lives up to its full potential once you have perfectly mastered your bike and your environment. Driving around, you leave a glowy trail behind you for your friend. Following the trail, he will accumulate nitro, allowing him to catch up on you at full speed. But you can also gather some on your own by destroying props, doing epic jumps and passing near walls. 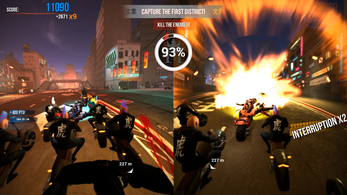 Nitro is a helpful and versatile tool that can help you find your teammate, escape the punks or destroy them. Don’t forget to use it! 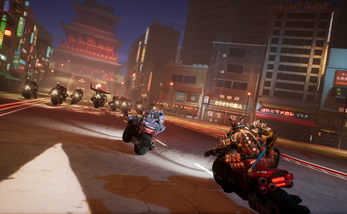 As modern day samurais, you can use your bikes as much as your weapons to battle your opponents. 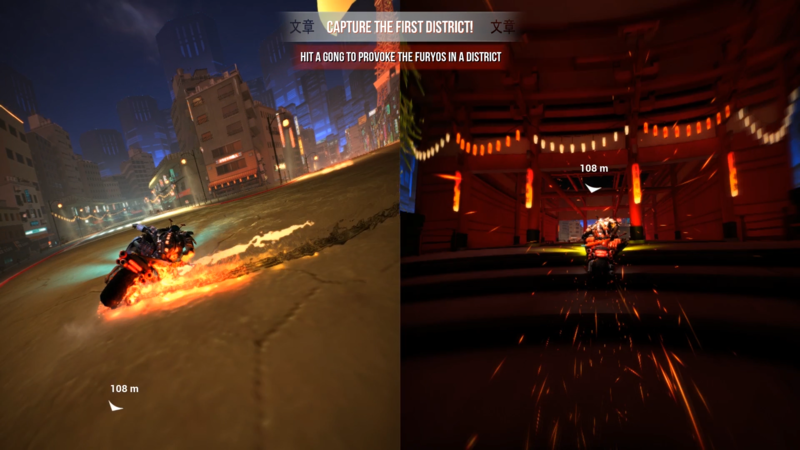 Enemies tend to follow around, so lure them into crashing by driving close to walls or obstacles. 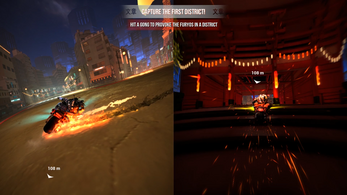 In a more aggressive way, ramming an enemy at full speed with the nitro will also grant you a nice explosive kill. To defend yourself from the punks, use the kick: a light attack that can be performed by pushing the right hand stick on the left or right. Much like nitro, it can be used in both a defensive, and an offensive way : either by repelling enemies or by throwing them into walls, which will definitely kill them. The kick can also interrupt enemy attacks. When a punk tries to attack you, a flashing symbol appears above his head. If you kick him right before he hits, he will be immediately thrown off his bike to get a taste of the concrete below. The Emperor’s Blast is a cooperative super attack that unleashes mystical powers upon your enemies. Its principle is quite straightforward: upon reaching your teammate, you can charge you emperor’s blast by pushing the right stick up. The more you charge it, the more nitro it consumes. When you release the stick, you rush to your buddy and trigger the mighty Emperor’s Blast. 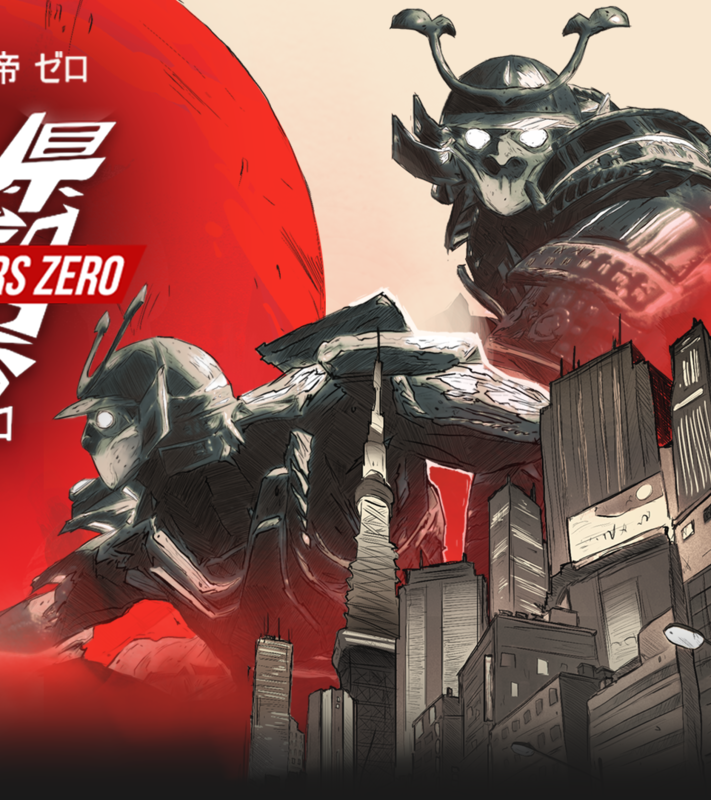 Huge thanks to everyone who was - one way or another - involved in the creation of Aichi Emperors Zero. Full credits available in game. We would recommend to play this game on a high-end pc configuration as it currently lacks optimization. Enemies and vfx can have a heavy impact on performances. If the framerate drops below a certain threshold, to avoid bigger issues we freeze the game physics. Sorry for this inconvenience. 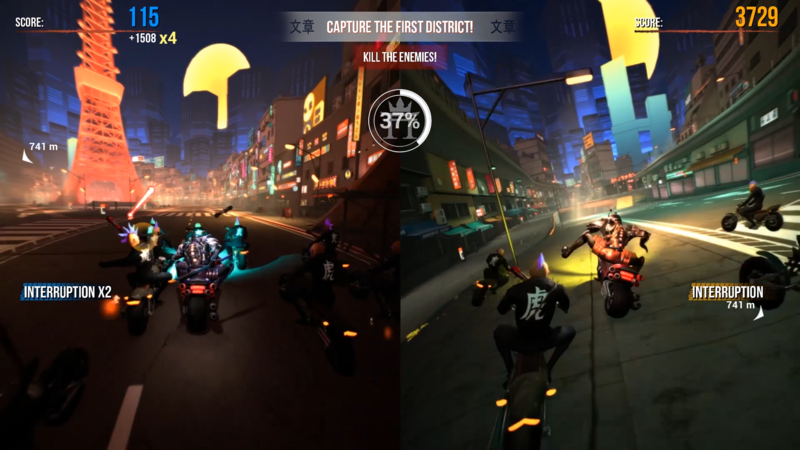 Aichi Emperors Zero was developed during 9 months as a graduation project at Supinfogame Rubika, France. Please note that this game will be not published nor developed further. You can expect small patches to fix some of the issues and maybe optimization, but no big features like online multiplayer, bigger map or anything like that. The development team is now split and everyone is focused on their internships and future career. If you want to support us, the best way to do so is to share this game on social media. This would be awesome and we would be very grateful! 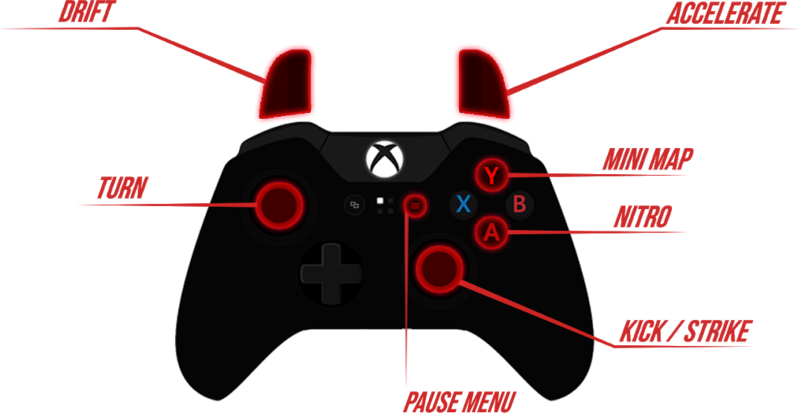 Two controllers have to be plugged in and be assigned controller 1 and 2. Really awesome stuff here! 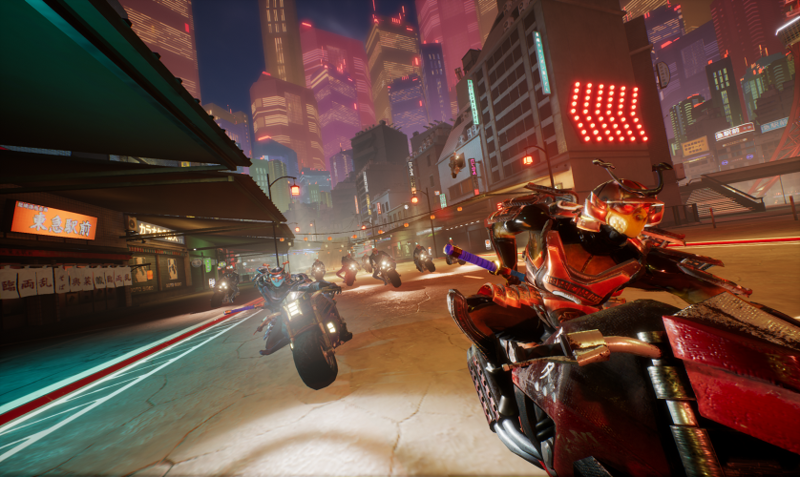 Though the lack of singleplayer is a little bit of a letdown and the omission of some graphical settings made the game run like an electric bicycle instead of a powerhouse motorcycle at points. But the gameplay itself is pretty damn good! The sense of speed and weight are really felt and the cooperative abilities are something I haven't seen before. With some optimization, graphical settings and maaaaybe some singleplayer, this would make a great game even better! 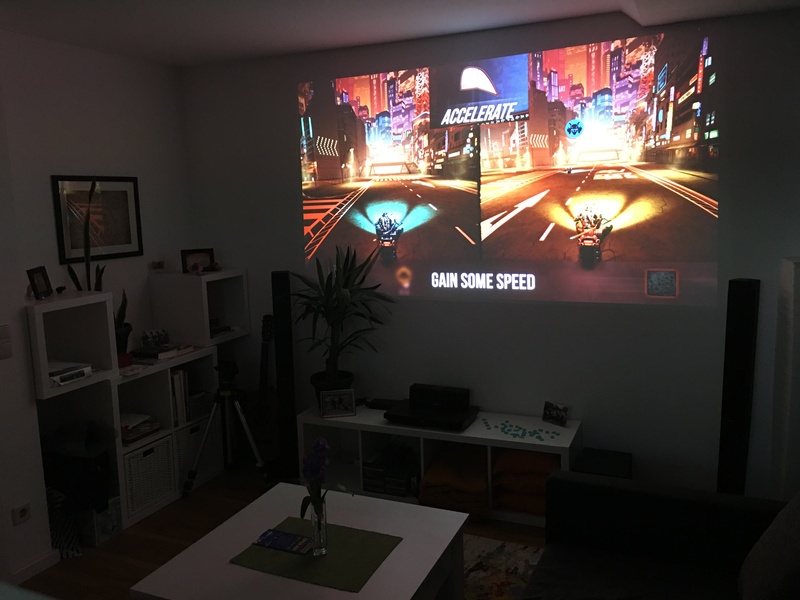 - frei begehbare Spielwelt, Charaktere sind nicht aneinander "gebunden"
I had a great time with this game playing it with my girlfriend yesterday. Sadly we encountered a bug: when you lose the Bossbattle, the blur on screen persists so it makes it unplayable and you are practically not able to repeat the mission. Hey Verganon! Thanks for your feedback, glad to hear that you and your girlfriend liked it. Weird bug indeed and so unfortunate that it occurred twice in a row. We will try to fix this so you can finish the game. We will keep you updated on this. Cheers! That would be great. The Game still runs and you are theoretically able to restart the mission but it's not playable due to the blur. I just uploaded a short Clip on my Dropbox, so you can see what exactly happens and maybe find a way to reproduce and fix it. Thanks for the video, it will help a lot! Thanks for the video, it's awesome!